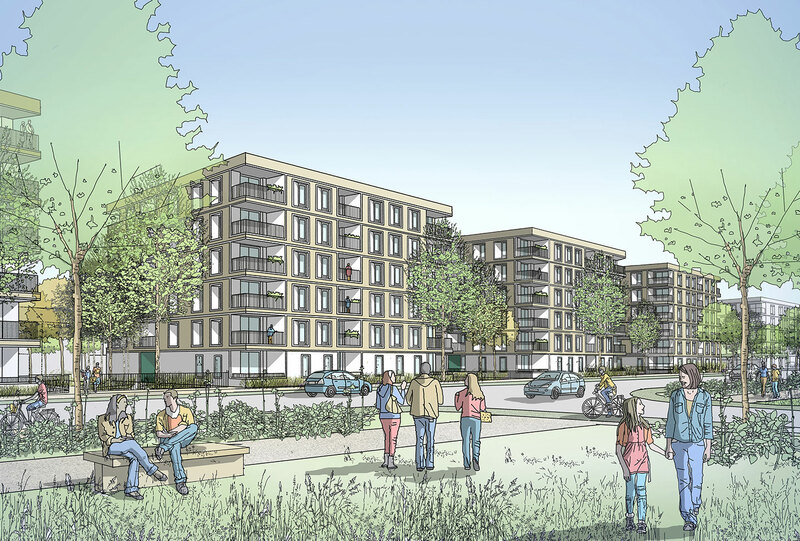 The draft London Plan sets delivery targets of 65,000 new homes a year, which sits within the broader national housing targets. At Ayre Chamberlain Gaunt, we believe good design can bring positive social benefits to communities and create moments of joy. When rising to the housing challenge however, too often in the industry ‘design’ is considered to be a cost as opposed to something that brings value. 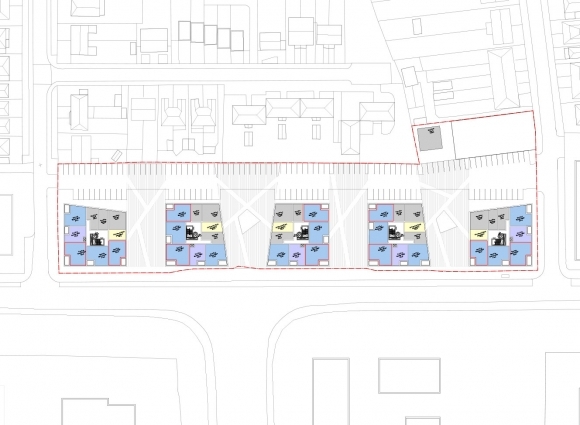 We were recently asked by award-winning offsite contractor, Mid Group, to assist them with a study looking at the cost efficiency of a 200-unit scheme (through modular design) for a leading London Housing Association. 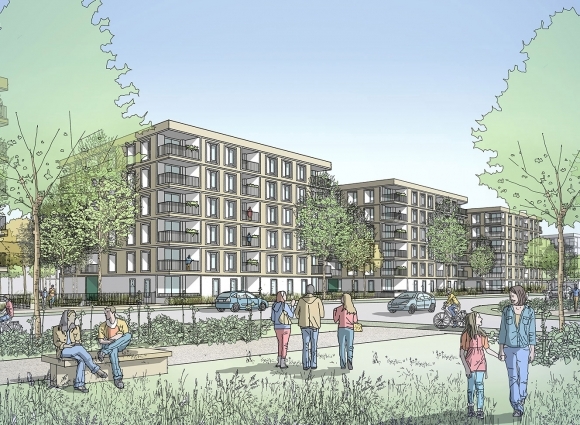 The project for 200 new homes forms part of a wider masterplan of several thousand which, when procured through a conventional contracting approach, had resulted in costs in the region of 160% of the budget in order to take the scheme forward from RIBA Stage 2. 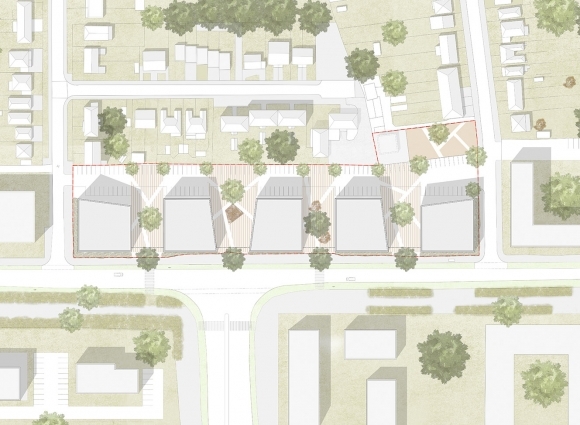 Our brief was to work with Mid Group and their supply chain to prepare a feasibility design, testing whether a scheme that met the original budget was possible, whilst still complying with both the HA’s standards and London Housing Design Guide. One of the reasons we were so delighted to engage with the study was that at the heart of this approach are many of the aims of the government’s Construction 2025 White Paper. In collaboration with the project team, we developed a series of design parameters that from inception sought to ensure speed, efficiency and ease of construction. Considering a project in more technical detail at an early stage is thought by some to lead to design being marginalised. We don’t agree with this principle. Rather, we believe it provides a different framework for the team’s creativity to respond to, allowing value arguments to be consciously made when the project requires the parameters to change. Design for Manufacture & Assembly (DfMA) is a mind-set, with sustainability at its core. When something is manufactured as opposed to built, the chain of custody is stronger and waste is minimised. Repetition creates more opportunities for innovation and performance improvement. 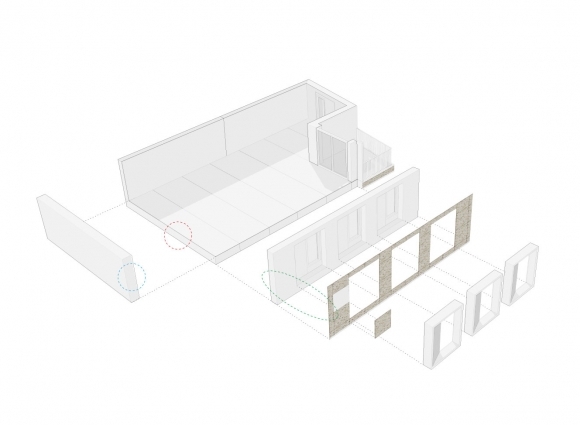 This doesn’t just relate to mass production, as inevitably standard components will be developed that will offer the opportunity to bring the offsite benefits to smaller, more bespoke projects. 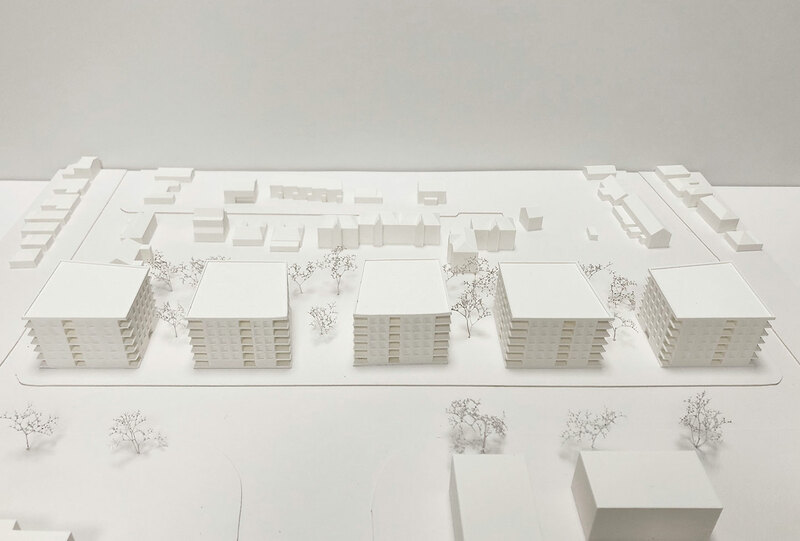 Our brief was to achieve the required mix of apartment sizes across a series of identical floor plans, in six storeys or less. The first exercise we undertook was to review the net to gross efficiency of the sample scheme, which had established the permitted massing on our site, and to test some typical floorplate options. We had anticipated that increasing the number of units served by each circulation core from six to the LHDG maximum of eight would result in the most efficient arrangement. Owing to the number of larger units within our brief however, we found that seven was actually optimal. 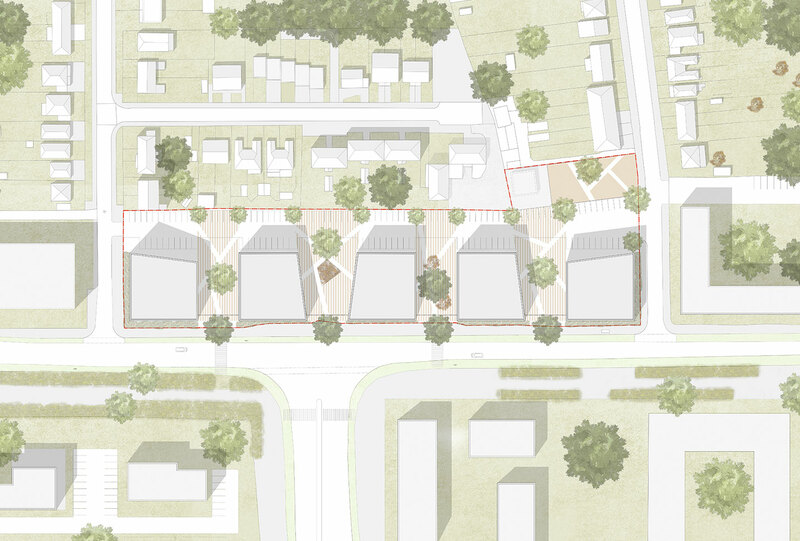 With this principle established, we began exploring how a design with five buildings could be accommodated on the site whilst also developing the form. Our workshop with the team reaffirmed the importance of rigorously pursuing standardisation wherever possible, even at this early stage of doing little more than working with appropriately sized volumes. The drive for efficiency follows through to minimising the number of manufacture drawings – more drawings means rejigging, recalibration of equipment, more checking required, more site coordination, more time, and more cost. 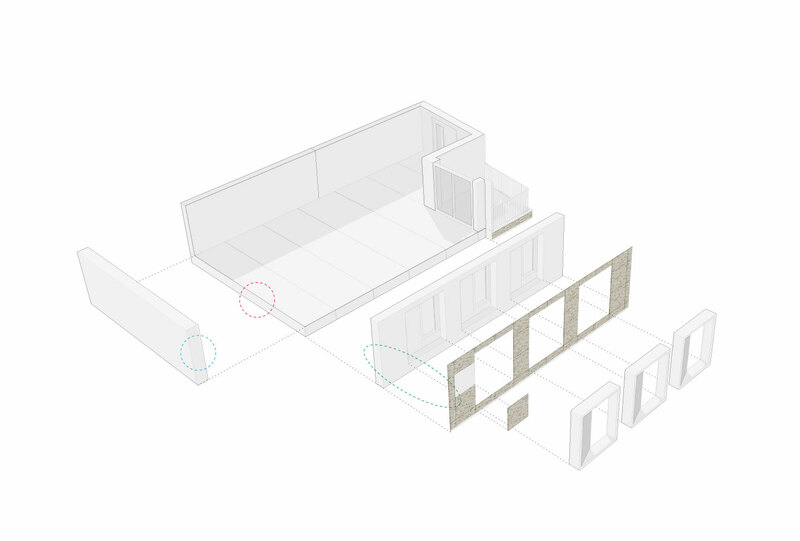 With regard to budget, we worked with Mid Group to reverse engineer a breakdown to hit the project that: optimises layouts and efficiency within the modular components; minimises site operations, reducing preliminaries. Both of these factors reduce the cost of the building’s core to the minimum, and have the added benefit of dramatically improving health and safety through the transition of operations to manufacture, as opposed to on site. 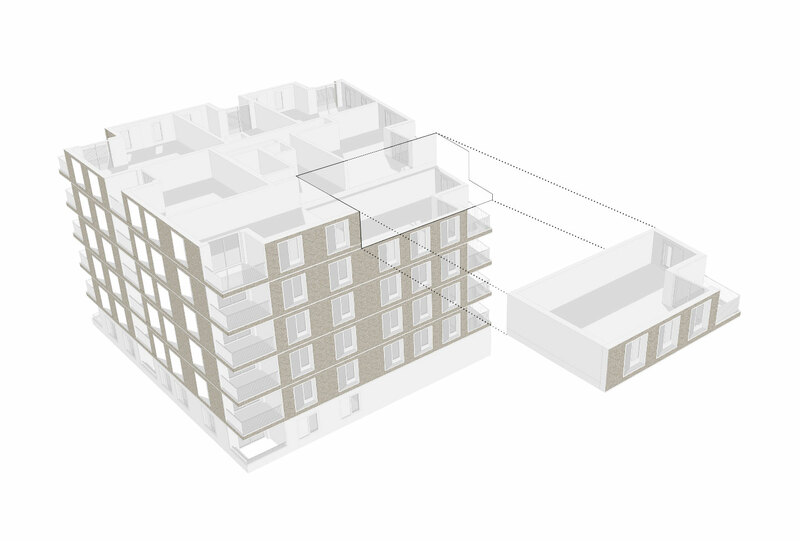 As an organisation, Mid Group are really refreshing to work with as they don’t have any particular bias for the solution – their approach is to provide the right system for the project specifics, be it pre-cast, unitised, volumetric, SIPS (as we are using), or anything else in-between. 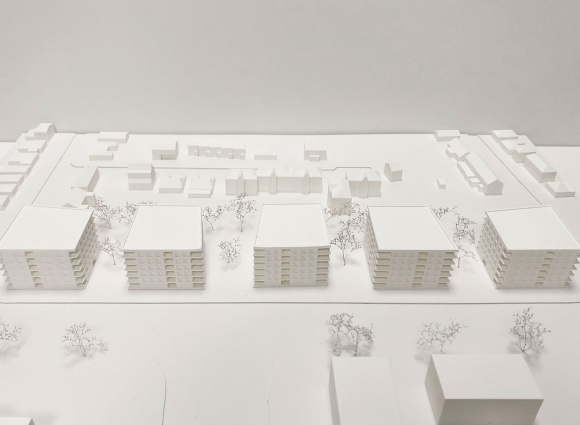 We expect each of the six storey buildings of forty apartments to be erected in four weeks. By utilising efficiency within the core structure, we are able to invest more of the project budget on the parts people see and touch. 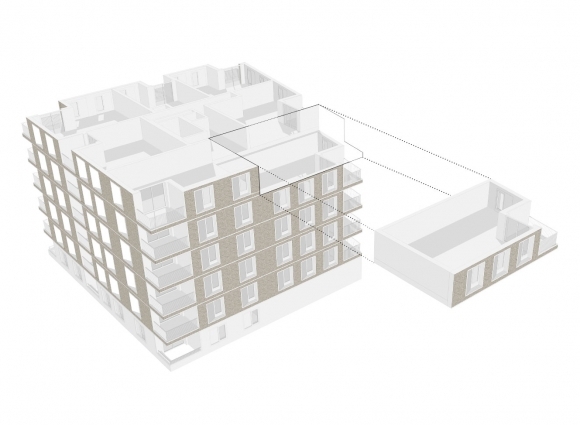 In this instance, we have proposed a brick slipped façade. For a practice that embraces materials and texture, this could be seen to be a compromise. If we are honest though, most of our recent buildings feature brickwork constructed off angle supports, hung off a concrete frame. As with most of the new London vernacular, brickwork is now used as a rainscreen, not a load bearing element as it once was. If we move beyond this study, we can bring an honesty to our use of slips by capitalising on the freedom to play with stacked or other bonds, usually inhibited by conventional brickwork techniques. Some architects may be looking at Modern Methods of Construction (MMC) and DfMA as yet another assault on the value of architecture in society. We don’t share this view. We believe MMC and DfMa have an essential part to play in meeting the enormous challenges we have in contemporary society, and we think there are great opportunities for architects to be leading the way. 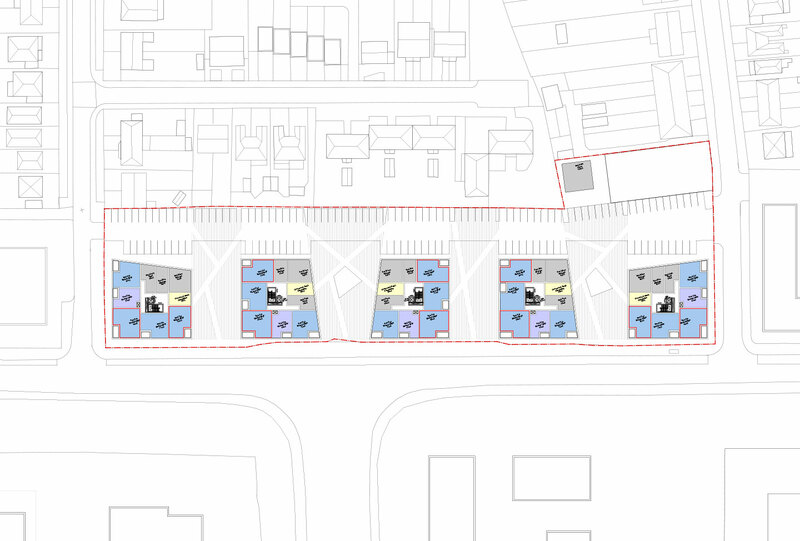 Specifically, we can see this occurring at stages identified as Stages 0 & 7 within the RIBA Plan of Work. To realise the potential of MMC and DfMA it is imperative that both horizontal and vertical integration of the project delivery supply chain occur. This brings what has traditionally been seen as the construction team to the project at the pre-planning stages. By working in collaboration with the client and project team, and collecting feedback when the project is both evolving and in use, we can create the conditions for success. Only through true ‘partnership’ can we achieve and share the potential benefits available.